East Coast Mechanical has been in the air conditioning service business since 1985. For the past 3 decades, our capable, highly-skilled technicians have been keeping the residents of South Florida cool and comfortable in their homes. Allow us to do the same for you. When you choose East Coast Mechanical for AC replacement, installation, repair, and maintenance, you’re choosing the best AC company in the business! Boca Raton’s best all-around cooling services company! East Coast Mechanical has the best AC repair technicians in the business. In addition to routine repair appointments, we also offer 24-hour emergency repair service so that you can always count on us to be there when you need assistance, even in the middle of the night. East Coast Mechanical is Boca Raton’s premier air conditioner installation company. Looking for a brand-new air conditioner for your home? Allow our skilled technicians to install your new system. We can replace old systems that aren’t working properly or offer you extensive options for new units. We also have flexible financing options for those with approved credit. Trust East Coast Mechanical find and install the perfect AC system for your home and budget! Quality preventative air conditioning maintenance helps keep your air conditioning unit running smoothly year-round. Dirty coils and blower wheels can heavily impact the airflow of your air conditioning unit, and this can reduce efficiency, causing your energy bills to skyrocket. Don’t allow this to happen to your AC unit. Get yearly AC maintenance with East Coast Mechanical. 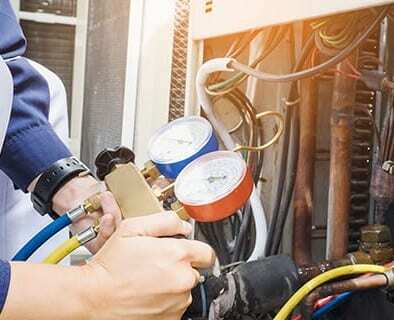 Our technicians are well-versed in comprehensive tune-ups, and with their help, your AC system will run smoothly, use less energy, and be less likely to break down in the future! East Coast Mechanical provides Boca Raton and the surrounding areas with top-quality cooling services. Ready to book a service appointment? Call us today!